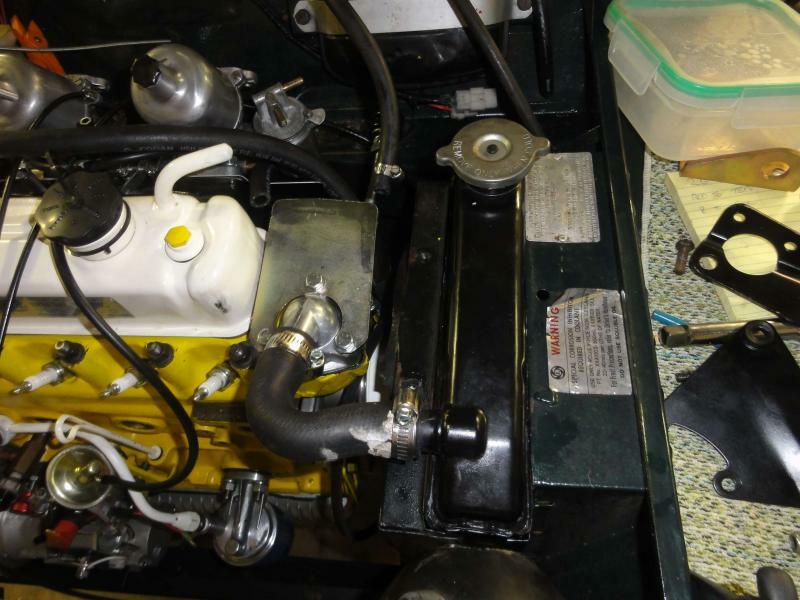 Hi guys, I am in the process of fitting a 1275 into the little green beast. The 998 came out easy BUT, (i hate buts) i am having all sorts of issues fitting the 1275. The radiator is hard up against the shroud in the engine bay, i have the option of fitting a narrower fan spacer and fabricating new radiator mounts to suit or cutting about 10mm from the edge of the shroud. I really don't want to cut anything if possible, surely the shrouds are all the same regardless of engine? The gear selector rod and stay under the car are too long by about 14 mm, this i will fix by moving the bracket back, this will have the added bonus of moving the gear lever a little closer to my arm. The engine stays, well the std one seem a little short as well. All these things are fixable BUT is this normal for an engine swap from 998 to 1275. The radiator shroud is wider in older bodies and over the years got narrower, although looking at your picture you seem to be fitting into a fairly late model body. There are a couple of different lower brackets(shroud to the Engine mount bracket) and the top bracket in your picture I would have thought would be okay. For the top bracket there is also a 'long triangle' version that fits over the top of the thermo housing, but not the housing you have there, the rear facing outlet type. The LT bracket can can have two sets of holes in them to adjust the distance from the engine. The engine steady bracket for the firewall at the radiator end is different for a 1275 than the smaller blocks. It tends to have two holes in it and could be why you think the steady is too short. What is the shield on the thermostat housing? The 1275 block is slightly taller, 1” I think. Another thing you’ll likely come across is the exhaust. You might need to move the bracket that bolts to the gearbox. The shroud is a mount for the engine steady at the radiator end, there is a plate that mounts on the firewall with what looks to be threaded rod as an adjustable link. I think i have sorted everything under the car, the remote change is hooked up and everything appears to be working well. The exhaust is a maniflow type thing, i am going to trailer the car to an exhaust guy up here and have a new one fabricated so i will work mounts out then. The top radiator mount i have is never going to work, it's probably 15mm to wide and thats with the radiator hard up against the shroud. The only thing i can see to do is fit a narrow fan spacer, modify the lower radiator mount and make a new top mount. The rear engine steady i might have to cut and lengthen, only needs about 5 mm. The car is a 1977 model. OK, more progress, the top radiator bracket that mini sport UK sent me was for a clubman GT the one i needed is for 1275 or cooper s version and is much narrower.